Curfew was imposed in parts of Ujjain in Madhya Pradesh after groups belonging to different communities clashed, leading to tension in the town. The trouble had begun during Ganeshotsava celebrations. An irate mob resorted to stone pelting in which policemen sustained injuries. The vehicle of IG police was also damaged in the incident. 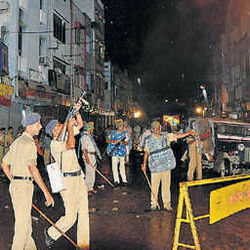 As situation worsened, additional police force was rushed. In view of heavy stone pelting, police used tear gas shells to quell the situation. Later curfew was imposed in five police station areas including Mahakaal, Jiwajiganj, Kotwali and Khara Kuaan. Police said that Ganesh idol was installed in a shop on the mosque premises, which led to a heated argument between two sides. After senior officials intervened, it as amicably agreed upon to install the idol at another place. But some activists belonging to Hindu organisations protested against the decision and this led to the group clash. Later reports said that two persons were killed in the ensuing violence. Rapid Action Force (RAF) was deployed. Police said that situation was under control. Administration had stepped up vigil and declared holiday for schools.